Eight years is a long time in politics, something Barack Obama knows all too well. With his second term as the President of the United States finally coming to an end, it’s fair to say many of us are going to miss his genuine swagger and know-how that he brings to American politics. 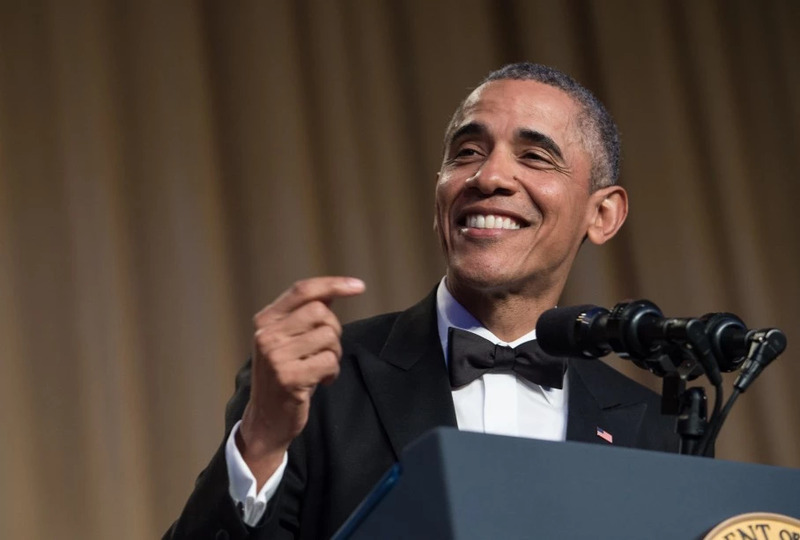 And in his final White House correspondents’ dinner (basically a tongue-in-cheek address to press, politicians and celebs) he certainly didn’t disappoint, taking swipes at a bunch of presidential candidates, Prince George (treason) and Kendall Jenner. Eight years ago, I was a young man full of idealism and vigor. And look at me now, I am gray, grizzled and just counting down the days to my death panel. In fact somebody recently said to me, ‘Mr. President, you are so yesterday. Justin Trudeau has completely replaced you. He is so handsome and he’s so charming. He’s the future.’ And I said ‘Justin, just give it a rest.’ I resented that. To be fair you can understand why, look at this guy, Jesus. A lot of folks have been surprised by the Bernie phenomenon, especially his appeal to young people. But not me. I get it. Just recently a young person came up to me and said she was sick of politicians standing in the way of her dreams. As if we were actually going to let Malia go to Burning Man this year. Was not going to happen. Bernie might have let her go. Not us. I am hurt though, Bernie, that you have been distancing yourself little from me. I mean that’s just not something that you do to your comrade. You’ve got to admit it though, Hillary trying to appeal to young voters is a little but like your relative who just signed up for Facebook. ‘Dear America, did you get my poke? Is it appearing on your wall? I’m not sure I’m using this right. Love, Aunt Hillary.’ It’s not entirely persuasive. If he made that joke a few hundred years back he would have been sent straight to the Tower of London. Neither do we mate, neither do we. You know I’m going to talk about Trump. Come on. We weren’t just going to stop there. Come on. Although I am a little hurt that he’s not here tonight. We had so much fun that last time, And it is surprising. You’ve got a room full of reporters, celebrities, cameras. And he says no. Is this dinner too tacky for the Donald? What could he possibly be doing instead? Is he at home eating a Trump steak, tweeting out insults to Angela Merkel? What’s he doin’? He pretty much went all in on ‘The Donald’ and who can blame him? We want more! We want more! 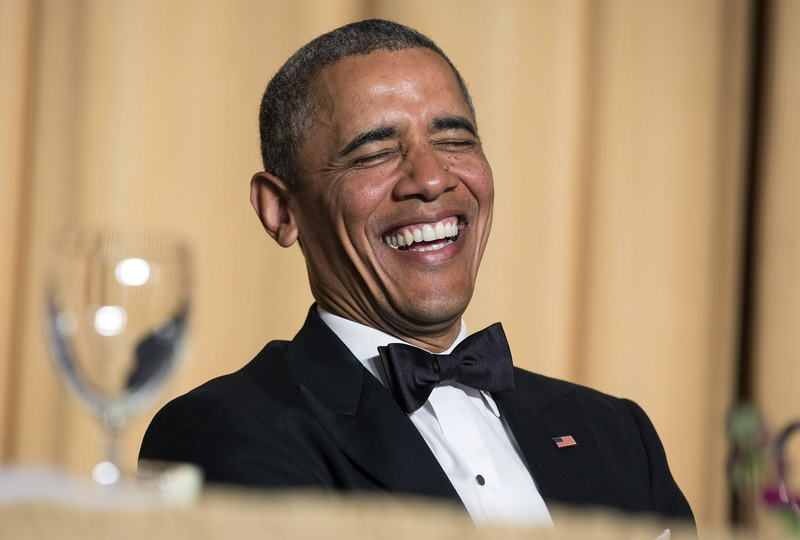 Anyway, after all the gags, he got a bit serious and spoke about what he’d be doing after his term ends and thanked a whole host of people for their support during his tenure. With the mic drop and that Larry Wilmore ending I have to honestly say I will definitely miss the Obama presidency. That was glorious. The mic drop to end all mic drops. We’re going to miss you Barack, especially glorious moments like this.